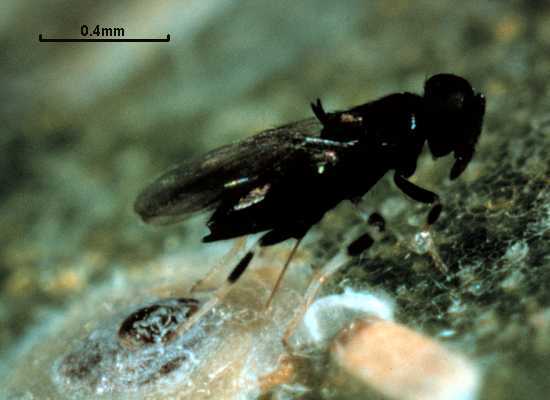 Female Plagiomerus diaspidis ovipositing into scale insect, photographed by R. M. Hendrickson Jr. The name 'Mirini' has been used for a tribe of parasitic wasps in the Encyrtidae; this name is, however, a junior synonym of a tribe of plant-bugs in the Heteroptera. It should be called the Bothriothoracini. Characters (from Beardsley 1976, as Bothriothoracini): Tarsi 5-segmented; forewing, when present, with marginal, postmarginal and stigmal veins relatively well developed; paratergites absent; gonostyli always present and distinct; mandibles generally tridentate, often with two sharp teeth and a truncation, rarely quadridentate; female hypopygium rarely boat-shaped, rarely enclosing ovipositor. Beardsley, J. W., Jr. 1976. A synopsis of the Encyrtidae of the Hawaiian Islands with keys to general and species (Hymenoptera: Chalcidoidae). Proceedings, Hawaiian Entomological Society 22 (2): 181-195. [G32b] Girault, A. A. 1932b. New lower Hymenoptera from Australia and India. Privately published (reprinted Gordh, G., A. S. Menke, E. C. Dahms & J. C. Hall. 1979. The privately printed papers of A. A. Girault. Memoirs of the American Entomological Institute 28: 293-298).